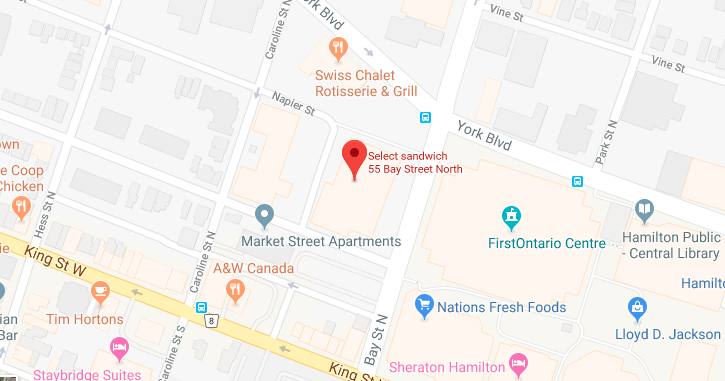 Select Sandwich is located in downtown Hamilton at 55 Bay Street. Our excellent selection of sandwiches, entrees, salads, soups, appetizers, treats and more are a great choice for any meeting or special event. All foods are prepared fresh, just for you, and can be delivered to your location. Our fast, fresh and friendly Hamilton catering services are sure to please all of your guests. Choose from a variety of sandwiches as well as delicious and healthy salads, fruit, cookies and desserts. Whether you’re looking for affordable Hamilton caterers, or just searching for a great place to stop in and enjoy a meal, choose Select Sandwich!